What bothered me most about UI-Beta was the way it handled tabs for searches and schedules. I got the (brilliant?) idea of creating a "Collapsable Panel" (which, for all you programmers, is a subclass of Panel) and putting each search specification, search result, schedule, and even Schedule Builder specification in one of these, so that everything could just fit in one window. 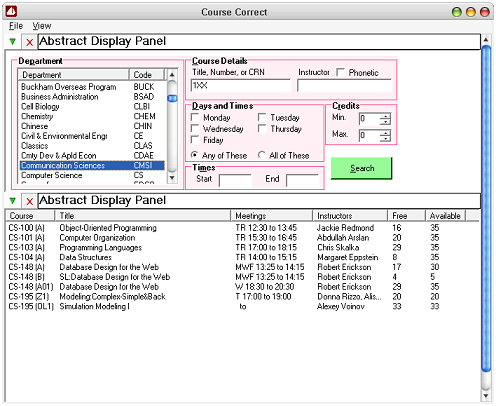 This new user interface is small enough to fit in an 800x600 screen, but you can see here that adding courses from this list to a schedule would require scrolling down to where one is visible (or at least collapsing the search criteria at the top). A lot of the mechanics for searching work great in this structure, but I was never happy about how schedules just got mixed in with everything else.